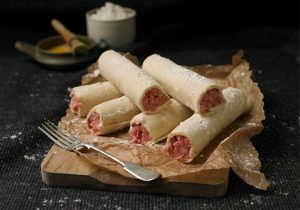 I think it’s fair to say that our sausage rolls are one of our best loved products! Our social media always goes crazy whenever we post anything about them! You only need to try them to see why! These little delights are packed full of our finest quality pork sausage meat, encased in the most buttery, flaky puff pastry! There’s only one word really…delicious!! Fresh rosemary, cherry tomatoes and condiments for dressing and dipping! A nice, large serving platter. pre-heat your oven to 180c and line a large baking tray with non stick baking parchment. on a clean board, using a sharp knife cut your sausage roll in half and the next half again so you end up with 4 even sized mini sausage rolls, repeat with the rest of the pack. 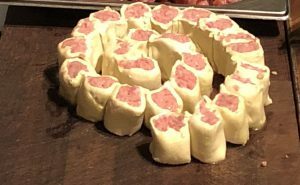 Now it’s a case of arranging the sausage rolls into a large swirl design directly on the lines baking tray (see image below). To do this you want to start by taking one of your mini sausage rolls and gently pinch the edge where the pastry meets, to create a small lip to join your next sausage roll to, you’ll need to repeat the process until you have created your swirl. Place your first roll in the centre of the baking tray then add the second by gently pressing the two pastry “lips” together so that they are lightly joined. bake for 30-35 minutes or until the pastry is golden and the meat cooked through. Leave for a couple of minutes to cool slightly before carefully sliding the whole thing onto your serving board.